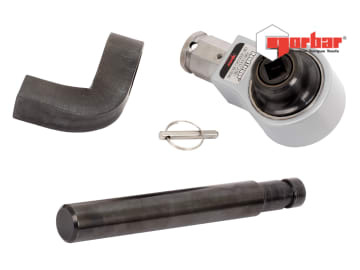 The Norbar HandTorque­® HT3-1000 has been designed for use where it is necessary to provide higher torques than would otherwise be possible due to limitations of space or operator strength. Input to the multiplier is via a ratchet torque wrench set to one fifth of the desired output torque. The quick change cranked reaction with improved flexibility allows for a reaction in 8 orientations. It has a robust, compact design for minimal maintenance and increased life. Supplied with 2 reaction bar styles for maximum versatility.